Red ginger plants are the most widely used is the rhizome sections. It is powered by a lot of red ginger rhizome store content and the effect of natural compounds as the taste spicy to taste typical red ginger itself. The content of chemical compounds consisting of a red ginger gingerol, zingeron, and shogaol. Besides red ginger contains 1-4% volatile oil and oleoresin. Essential oils in ginger red also has other compound component consisting of zingerberin, kamfena, lemonin, zingiberen, zingiberal, gingeral and shogaol and other ingredients such as petroleum resins, starch, organic acids, malic acid and gingerin aksolat. This is what makes the benefits of a red ginger widely used by many people. - Rhizome of ginger is widely used as a liniment for gout and headaches. Red ginger besides containing chemical compounds also contains gingerol, 1.8-cineole 10-dehydro-gingerdione, 6-gingerdione, arginine, a-linolenic acid, aspartic, β-sitostrerol, caprylic acid, capsaicin, chlorogenis acid, farnesal, farnesene, farnesl and elements such as starch and starch, and fiber-fiber resin in small amounts. According to some studies, the essential oil of ginger contained elements: n-nonylaldehyde, d-camphene, d-β phellandrene, methyl heptenone, cineol, d-borneol, geraniol, linalool, acetates and caprylate, citral, chavicol and zingiberene. These materials are the most important sources of raw materials in the pharmaceutical industry and medicine. Red ginger essential oil content around 2.58 to 2.72% calculated on the dry weight. The content of essential oil of ginger is another kind of far are below. There is a large ginger or ginger rhinoceros ranged from 0.82 to 1.68% and the small ginger or ginger CVD ranged from 1.5 to 3.3%. Essential oils are generally less viscous and yellow are compounds that give flavor to the ginger. The amount of essential oil content is influenced by the age of the plant. That is, the older the age of the ginger is, the higher content of essential oil. 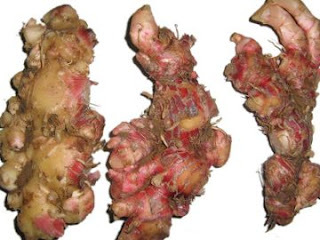 Based on the pharmacological effects, red ginger has benefits for blood circulation, boost the immune system, warm the body, anti-inflammatory and appetite enhancer and so when consumed by women who are in the menstrual period. Compounds and benefits of red ginger is great for the body to be salkah jaloan alternative traditional medicine for health. Therefore, it is not uncommon these people today that use a lot of red ginger.